Published in Rafu Shimpo, June 21, 1969, Japanese section. 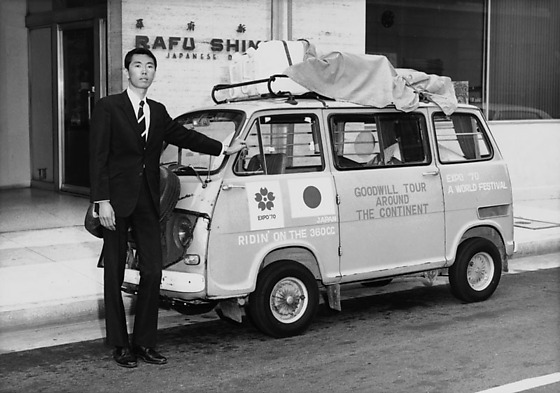 Tsutomo Ito of Mie prefecture, Japan on "Expo '70 Goodwill Tour Around the Continent" van in front the Rafu Shimpo building in Little Tokyo, Los Angeles, California, June 20, 1969. Van is decorated with Japanese flag and Expo '70 icon on driver's door and lettering, "Goodwill Tour Around the Continent", "Expo '70 a World Festival", and "Riding on the 360 cc". Includes Ito, a tall, thin, young man in suit, leaning against front of van and standing with seven older Japanese men in suits. "Rafu Shimpo. L.A. Japanese Daily News" on wall in background. Typed on original envelope: Mieken -- c/o Mr. Hashimoto. Tsutomo Ito decided to go on a tour of North America and seven countries in South and Central America to promote goodwill and the 1970 World Expo in Japan.